They are easy to use and deployable in a wide range of monitoring applications, including: warehouses, factory halls, office buildings, clean rooms, shipping, libraries, test facilities. Calibration of the instrument in at 3 humidity point: 25, 50 and 75%rh at Lab Ambient temperature (temperature at the time of calibration, within the range 20°C to 26°C). A UKAS (ISO 17025) calibration certificate listing results will be provided in the customer's name. Lead time is typically 6 to 10 days (on top of availability of the instrument). 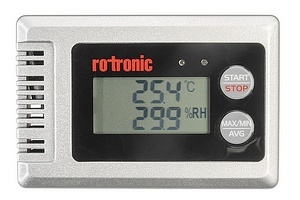 For calibration at different humidity points, specific temperature & humidity points, temperature only points or with different customer details on the certificate, please contact us for a price.